The survey was posted here with the following instruction - (ONLY FOR THOSE WHO REVIEWED VIA REVIEW CENTER.) The purpose of this survey is for us to learn the experiences of those who availed review for the Board Licensure Exam for Psychometrician offered by review centers. The result of the survey also aims to provide constructive feedback to these review centers for them to further improve their services. So we hope you can help answer this survey. 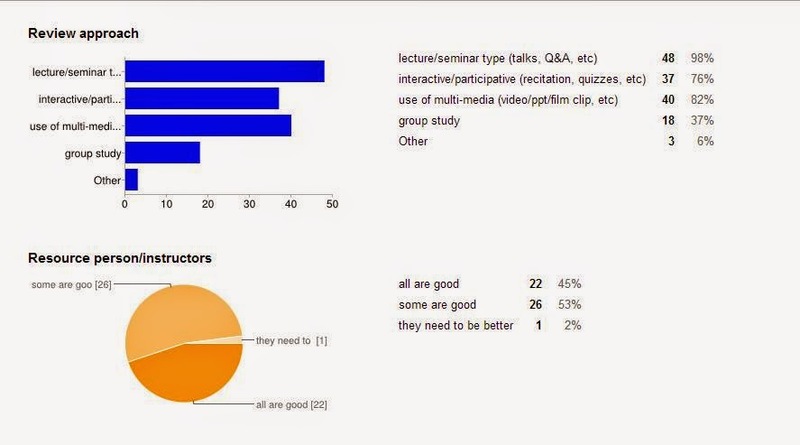 Survey result and output will be shared in our blog. Please be assured that your identity and responses will be kept confidential. Survey will take about 4-5 minutes to answer.) Replies were gathered from the period of November 1-6, 2014. There were 48 respondents. 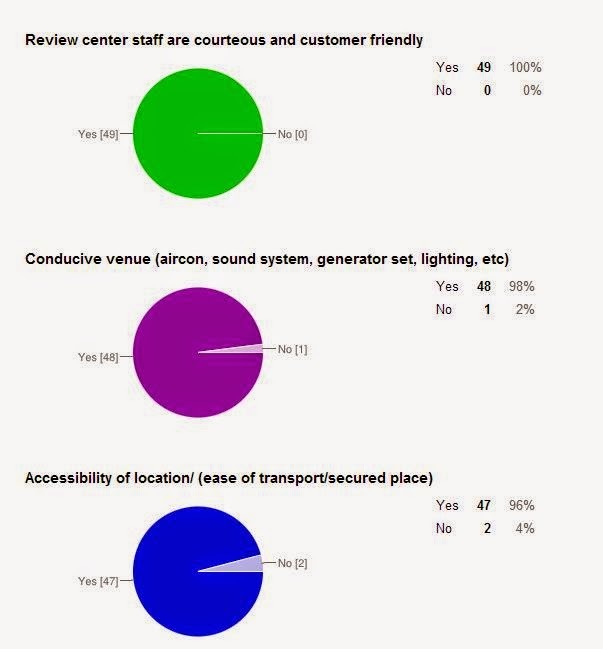 Below are the results/responses using Google Survey Analytics. 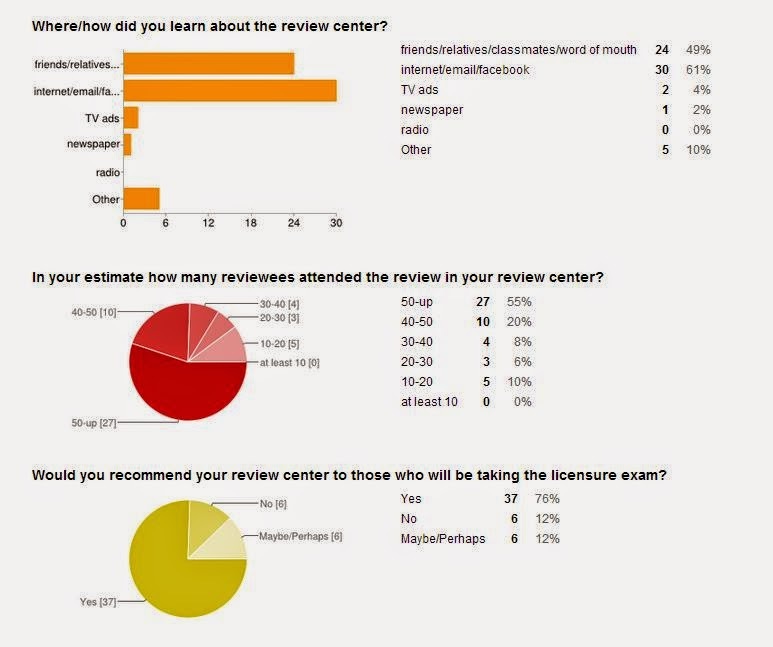 The questions asked was - What can you recommend to improve the services of your review center? 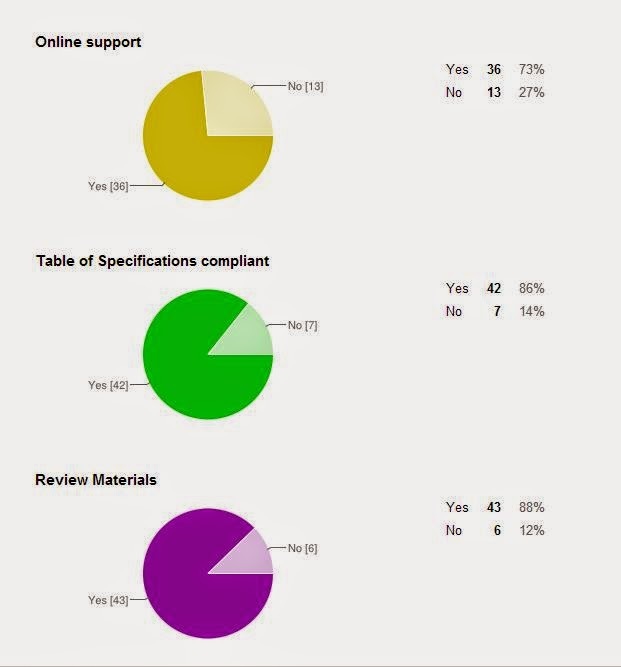 Primarily responses can be categorized into: review approach and methodology; handouts/materials; monitoring, punctuality and schedule; costs and others. Eliminate extraneous variables like noise due to building construction. Pre-exam held for only a day. Really toxic. There should be at least two professor in each subject.. because there is an instance where the professor is having an emergency so we're forced to just leave because there's no one who gonna teach us.. because the owner and also the head professor needs to accompany that professor. 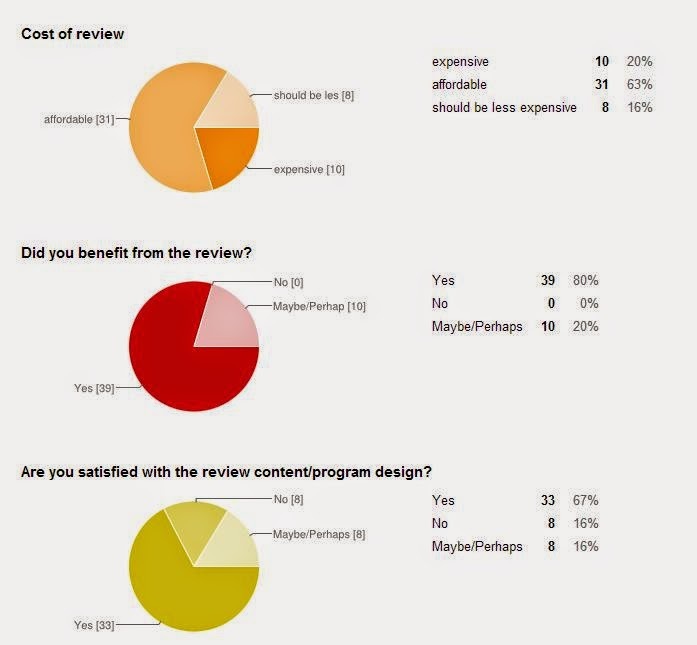 Review center should revise the program of the review. Be more strict on the attendance. Stress the importance of ToS. Have multiple rationalization and continuous feedback in the exam. Test checking should be done with precision and explanation of the answer. More outcome based sample questions. Change some of the resource person & distribute the review materials earlier. Create a team to ease the workload of the academic coordinator. More set of practice questions to answer especially during weekends. 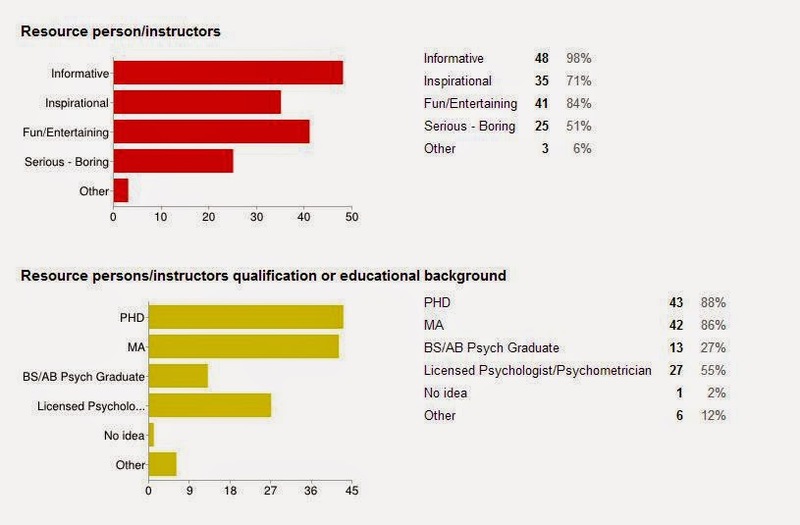 Provide the extra needs of the reviewees and the instructors should not be boring. Style of lecturing of instructors should be defined by expectations in review centers, not classroom setting. 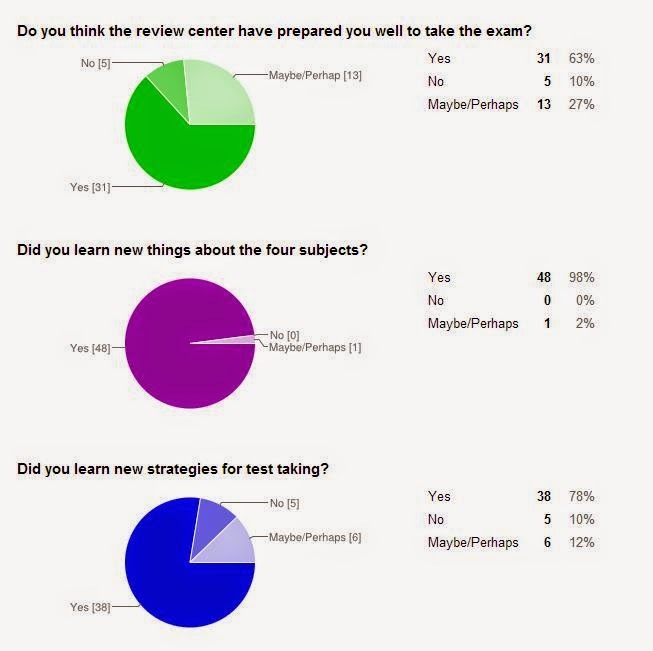 But it was understandable because the instructors didn't have experience in sitting in review centers. Invite more knowledgable lecturers. They and the review center staff should also encourage their students more in doing better in the review sessions and in the actual licensure examination. More time for Psychological Assessment and More test to develop testing skills. More useful handouts and test taking techniques and practice. Better handouts presentation, not merely printed powerpoint. I hope they will provide handouts and be prepared with ppts. Initially, they were not giving us our previous test papers for our reviewer materials but on the last few weeks, they gave us everything but without the answer key. They do not provide handouts. Before, apart from the fee, we also pay for photocopies of test paper. They also asked us for separate final coaching fee. Initially, we were almost 70 but at the end of the review, we were less than 20 because the other reviewees gave up beause of their system. Online ppts should be sent on time not 2 days before the exam (juice colored). Improve the print out materials and summary notes. The cost of the review was very expensive. It costs 11,500 and another 3,000 for the final coaching. Worse, the expenses for the handouts was not covered by the large amount we paid. We had to pay them for the copies of reviewers. And the whole review was not even outcome-based! Include handouts in the enrollment fee. Maybe it is better if we start on the right time, kasi meron yung mga weekends na ang schedule ay 8am pero nagsstart na ay 9am. Whole weekend sana. both sat and sunday. Not bad for a first time. Circumstances happened not in our favor are outside the center's control. But in the end, we were able to do what we need to do, e.g. final coaching. Instructors are really good on their subject matter. But there's this one instructor she's super fun but most of the time she's just telling stories and laughing. Great! Very humble Review Director and Very helpful staffs. The professors are known for their respective field. The lessons should have been made concise, but still it was an okay experience because of the friendly staff and lecturers. Supportive environment and great experience. Indeed, it was a great privilege to part of the Team Triad. Having professors who are seasoned, passionate, and truly believing on what we can do challenges us to be the best we can be. Building the best in us means giving the best for us. God bless. Great!! It is really informative and it really did give me new concepts and ideas. Spark Review Center offers a wide variety of pedagogues to their students. From video presentation, analogies, practice test, study buddies, group works and many more. 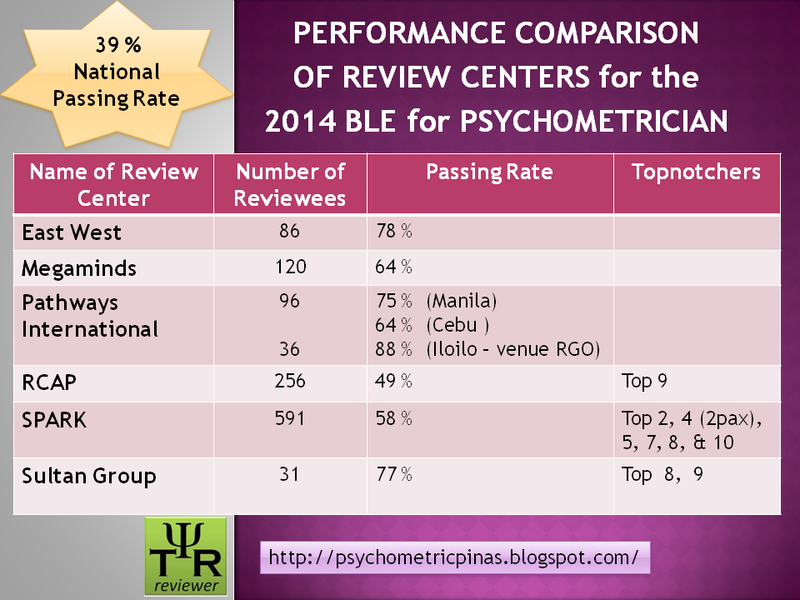 The review center molds its student to their fullest potential as a top notch Psychometrician or Psychologist Filipino practicioner with integrity and work ethics. I have a deep gratitude to our review center that whether I pass or fail they made a big help on my review. 2nd Batch is inherently more cheap compare to the first batch. I noticed that no handouts were given and thus all ppt are in emails. You should be fortunate to have a printer at home to print it for free. Furthermore, I'd like them to make a rationalization of the answers per item. Or rather have the most difficult items be rationalized extensively. 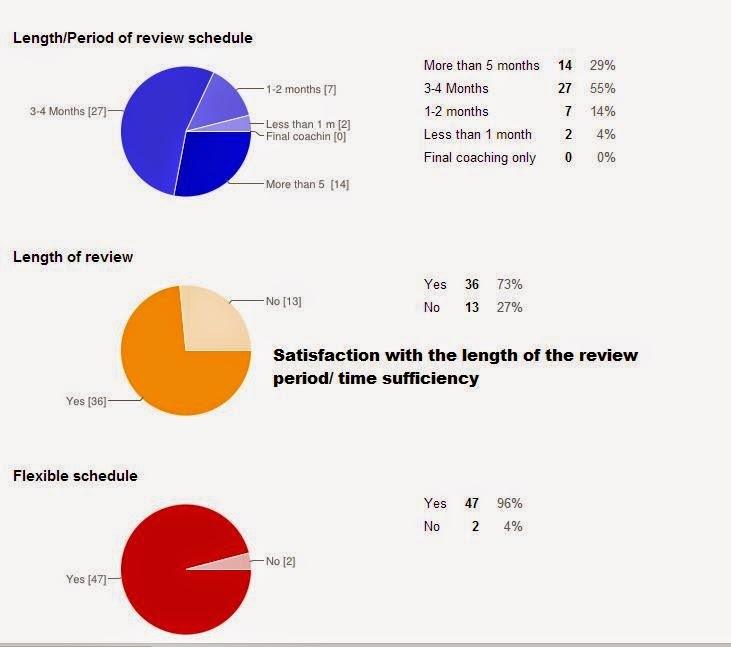 We are fortunate that the board were not so much tiring thus I should give the review center more ideas for improvement. -This statement is coming from a first batch having sit-ins in 2nd batch. 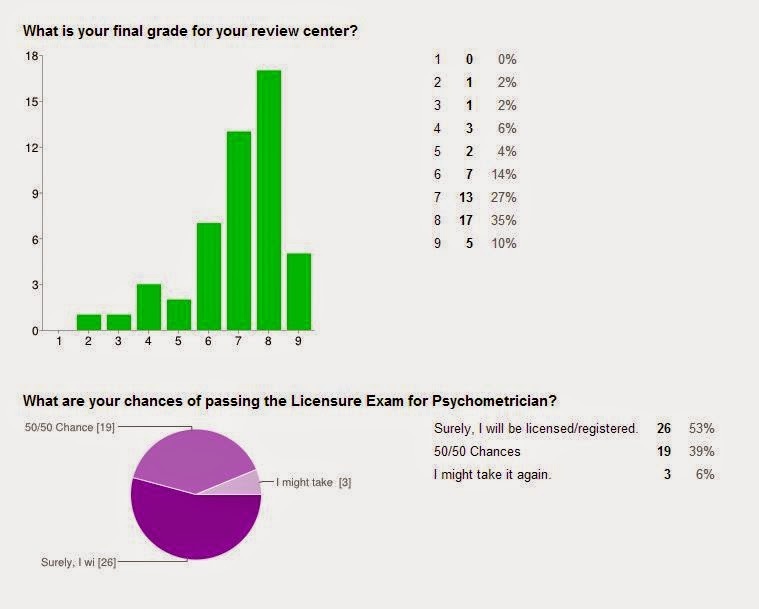 It did not really prepare me for Psych Assessment. no hard copy for handouts kasi puro lang powerpoint or kami mag sulat ng notes. Our lecturer in ab psych did not give her powerpoint or notes in ab psych kasi rumor has it that the lecturer is strict when it comes to distributing her powerpoint to others, which made reviewing abnormal psychology a struggle. 16 hours per subject was not enough, kasi siniksik yung mga topics in a short amount of time kaya yung retention eh hindi masyado mataas. Mabuti nalang maayos yung lecturer namin sa Industrial Psych at Theories of Personality kasi sila lang yung saving grace ng review namin. If I were to make a testimonial, I will definitely not recommend this review center. Never. It is a good review center but some lecturers are boring.